It was explained to me by Nels that it allows more control over the fueling and the ability to smooth out the bike. That's it. The sensors will send data to the ECU which will try to correct the fuel/air mix that the flash is correcting for the exhaust mods. If you don't remove them, the UCU will constant fight between the flash setting and the data from the sensors. A link would be even better than the pic! Thanks for that though! "The link pipe did NOT come with O2 Sensor plugs, if you are eliminating the O2's you will need to pick up (2) 12 x 1.25 x 20 Stainless bolts with (2) 12mm Stainess lock-washers to plug the holes for about $4.00. Also, use some sort of Locktite on the theads. I used the Blue Locktite." Blue loctite turns to goo at temps over 350 degrees F. It doesn't regain its bonding priorities when it cools; it turns to a brittle plastic that eventually becomes burnt carbon with repeated heat cycles. Honestly, I prefer anti-seize for this application. Later in life we may have options for wide and sensors that work with Flash Tune products. It will be nice to have the ability to remove these plugs at some point. The bolts are a great idea though. That's what I was thinking. It may even be too hot for red loctite, I'd have to check its temp range. It's about 450, but that stuff only lets go with heat. It may be permanent with red. should not interfere with the OS2 sensor as it is placed before the slip-on and after the catalytic. I guess I'll have a talk with Nels when the time comes. this is a great post. thanks for taking the time to put it together. One question I would have for everyone would be regarding the air filter. is there any benefit to swapping it out for something that breathes better? I haven't seen a post anywhere in the forums regarding a different air filter, but usually, when a freer flowing exhaust is used (for most applications), it's also beneficial to swap to a freer-breathing air filter. is that not the case with the -10? It stands to reason that an air filter with a higher flow rate would improve performance, but I haven't seen and specific FZ-10 info on the subject. Personally, I like a re-usable, cleanable air filter as opposed to paper or foam types. I haven't gotten into mine yet. finally took the plunge and paid for an ECU flash from 2WDW. can't wait. for now, I'm sticking with the stock exhaust. Nels informed me that i'll have to remove the O2 sensors. my question is, at what point? 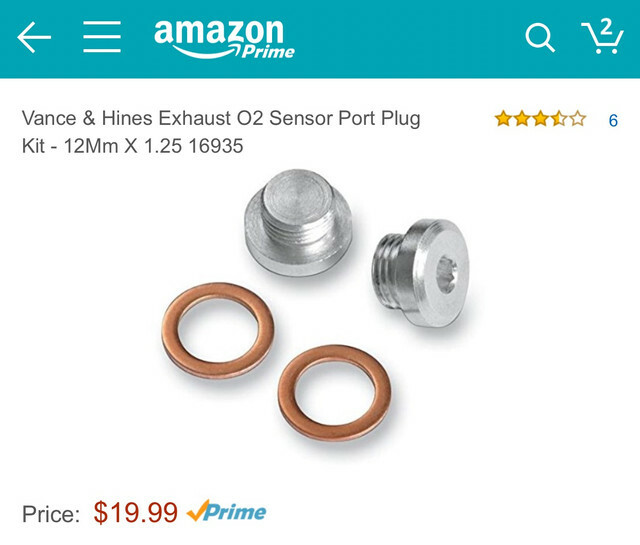 I thought I saw somewhere else on the forum that there was a point when the O2 sensors should be removed in order to not confuse the ECU? Of course, I can't find it now. can you (or anyone) assist? "At what point?" After removing ecu, before reinstalling. The left side sensor is pretty easily removed. The right side is more difficult. See above. If you leave them in when your reflashed ecu returns, you will probably have issues. DynaGuy says it correctly. The sensors need to be removed before you plug the ECU back in. Not only would the sensors confuse the new ECU program by providing conflicting air/fuel commands, it will cause your ECU to show fault codes. So, please, disconnect your sensors while the ECU is out. 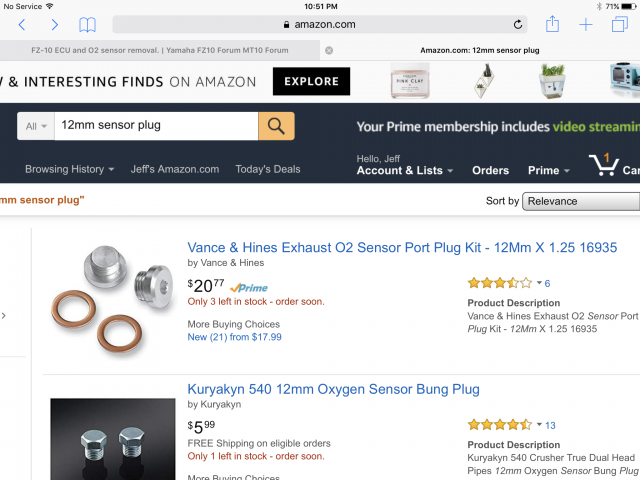 Also, you'll need to buy some plugs for the sensor holes. Or you could just buy 12mm x 1.25 stainless steel bolts. They don't need to be longer than 10 or 12mm. Bung plugs ordered and Sensor plug connectors order. Yeah I figured do this now and take advantage of the price. I can always send it back if I decide on an exhaust down the road. These guys are really good at what they do and extremely professional, but they flash a lot of units for many types of bikes. It's better to spell everything out so they know exactly what to do.